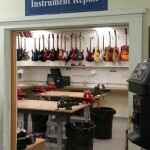 We have made A LOT of changes at the Eastern School of Fretted Instrument Repair! – Receive a $500.00 discount if tuition is paid in full on or prior to the start of instruction on first day of semester. Paid in-full amount $11,500.00. – $3,000.00 is due on or prior to the beginning of instruction on first day of semester leaving the total tuition balance of $9,000 to be paid in 15 weekly installments of $600.00 each. Instructors will assist and advise students in the selection of the necessary tools. Please see the Tools section for more information. Students who carelessly damage school property or equipment may be required to pay the repair or replacement costs. Students will need to meet all financial responsibilities before a Certificate of Graduation will be issued. We are now approved by the New Jersey State Approving Agency for Veterans Training.